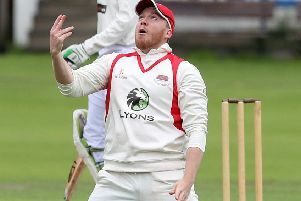 Captain Paul Stirling led from the front with a blistering innings of 78 from 48 balls, but his Ireland side was defeated with a six hit from the third last ball of the match by local-hero Sandeep Goud, as Oman Development XI won by two wickets in the second warm-up match at the Al Amerat Cricket Ground in Oman. For Ireland, squad rotation was the order of the day, and Andy McBrine, Shane Getkate and Lorcan Tucker came into the side, with Boyd Rankin, Stuart Thompson and Stuart Poynter making way. The home captain Twinkal Bhandari won the toss for the second game in a row and once more sent Ireland into bat first. Captain Paul Stirling punched the first ball of the innings to the boundary and set the tone for a lively opening stand. Stirling, and new T20 opening partner Kevin O’Brien, put on 28 from 21 balls before O’Brien holed out for 22 from 14 balls, which included three boundaries and a six. Stirling powered to a half-century off 35 balls, eventually being dismissed for 78 off 48 balls (9 x fours and 3 x sixes). Late-innings hitting by Harry Tector (18), Simi Singh (11), Shane Getkate (13*) and George Dockrell (13*) helped push the visitors innings to 170-6 from their 20 overs. The home side’s response got off to a poor start with Ireland’s paceman Peter Chase claiming two quick scalps – both off the first ball of his first and second overs respectively. Shane Getkate then claimed captain Bhandari, his first wicket in the senior side, to have Oman at 37-3 in the sixth over. Looking out of the contest, first game local hero Suraj Kumar hit back with 37 from 32 balls, however the honours today went to Sandeep Goud. The middle-order batter hit 55* from 29 balls, including a towering six to win the match off the third last ball. Ireland now have two days rest before they meet Oman in the first T20 International of the Quadrangular Tournament on Wednesday.